Not all Mac users want to update to OS X El Capitan, and if you’re in the group who wants to stay put with OS X Mavericks, Yosemite*, Mountain Lion, or even Snow Leopard on their Mac, that’s perfectly OK*, you probably have a reason to stay with the earlier Mac OS X releases. But, if you’re on a prior release of OS X, anytime you open the Mac App Store and the Updates section, you’ll be presented with a large splash screen to install OS X El Capitan. The banner will disappear and will no longer appear at the top of the Updates section of the Mac App Store, and it’ll be ab it easier to avoid accidentally installing the upgrade if you want to avoid it for whatever reason. If you decide you want to download OS X El Capitan on a later date, just search the App Store, or follow a link to get the installer directly from the App Store. * For what it’s worth, updating to OS X El Capitan is really an improvement when coming from OS X Yosemite, so if you’re holding off due to issues experienced with the prior Yosemite release, consider that OS X El Capitan is undoubtedly a better experience, it runs faster, and is seemingly more stable. Basically, OS X El Capitan in its first form is a better release than OS X Yosemite was. Justifying the update from OS X Mavericks or prior is more challenging, since users have probably opted to stay with OS X Mavericks or an earlier OS X release for a particular reason, and whether or not that is addressed in OS X El Capitan will vary per user and per Mac. Speaking from my own experience, I’ve been able to install OS X El Capitan on multiple Macs without a single issue, whereas I ran into a myriad of problems with Yosemite on some Macs for no obvious reason. Do you have an article on the differences between the Mav and the Cap? Are you forced to use the cloud or Facebook? Does Apple start to gather usage data on you like Windoze latest? I lost a couple of hours to understand what happen after migration Yosemite to El Capitan. My power book i7 is now freeze at lauching and i have reading that many persons are in same situation. If Apple should pay the time lost around the world because they lauch a wreach OS, I did’nt know if they have enough money. I am extremely disapointed about unprofesionnal working….. I have now to return to Yosemite which is stable and run correctly. Next time I will read the forum before updating. This is just what I needed! I do not want my wife accidentally installing the update. It took me since Febuary to disable all the unwelcome crap in Yosemite. I do not want to start over. I finally defeated the “update loop” that plauged me for months by stopping spotlight, and deleting all the index files. I do not want to start over on my long list of customizations that were necessary to make OS-X usable. I would be really interested about all YOUR ‘customisations’ of Yosemite (which I deinstalled every time till the version .3, which was reasonably working, AT LAST! ), a list of advices by you. Shocked by that horrible experience (AND LOOK!!!!!!) of Yosemite and its foolish Spotlight, just to mention the obvious) I decided to NOT install El Capitan (which I tested in public beta by the start on a partition) till at least a .1 release. What can I say? I made a dumb decision. I paid $1200 for a macbook with 8GB ram, and 256GB hard drive. I could have bought two Dell ultralights for that price. I thought, “Anything based on BSD, is good”. I was wrong. I removed mail, game-center, facetime, messaging, airdrop, chess, iPhoto, iMovie, garage-band, photo-booth, and I forget what else. I disabled the spotlight daemon. I removed the index files. I changed the share options (removed references to social networking etc). I installed VMware so I can run Linux in a VM. I forget right off hand, but somehow I prevented OS-X from creating those annoying resource forks, and other garbage on external drives. Every time my wife uses her sisters’ macbook, I have to clean up her thumb drive. My macbook is so much faster than before. I do not want to risk anything going wrong. If I am going to start over, I will just install Linux in be done with all the OS-X problems. In my experience Apple seldom improves things. They just carelessly add more bugs. I have done some research; the “update loop” nightmare has been around for years. Look at ios 9. Two weeks later, they are already released 9.02! I am a software developer (19 years of experience). I am looking for a job back in California. Maybe I should go to Apple. Bad software evidently carries no penalty there. I want to further state, that stuff that is unique to Apple like Spotlight Indexing, and iMessage are not “obvious”. For example, I owned an iPhone for a year before I read about iMessage in the paper. I am color blind (blue and green look the same, red and brown look the same to me). Messages did not make it to some of my friends. I thought my carrier just had poor SMS service, so we had all gone to WhatsApp. It is funny how Apple never asks if you want to opt into its unique services when you buy a device. They just opt you in, and if you are too busy working to take notice, too bad for you. I painted over the lens on that stupid built in web cam, and the microphone holes with silver paint! Web cans give me the creeps! My wife feels more comfortable using the thing now. Wow, you sound just like a Windows user, too. Perhaps you should just stay with Redmond and their OS. I certainly would be better off. Being a Linux person, it is hard to endorse Windows, but OS-X has proven itself to be a huge failure. I have concluded that Apple is, at best, a cult. If you are not into the cult, you do not follow the pseudo logic they employ. Failure and cult? Gave it your best shot there, eh Phred? I think you have made mote than one dumb decision in your life. So you changed from one proprietary messaging system which also supports SMS to another proprietary messaging system that support SMS (owned by Facebook, by the way)… tell me how that fixed your problem? And, Apple does not opt you in to using iMessages. You would have had to create an Apple ID and signed in with it. And Messages works just fine with SMS when sending a message to someone who not using iMessages-capable account themselves. You cannot install office 365, but you can install Office 2016 which integrates with Office 365. They are called .DS_Store files and you would only see them if you were using them on a computer that is not running OS X or navigating the folder structure in the command line with hidden files shown. So how do you see them on your Mac again? Such simple mistakes in your explanation makes me believe you are confused and do not understand. 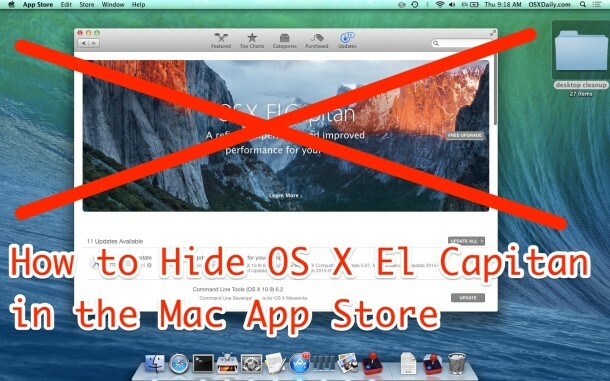 This hiding option has been around as early as Mountain Lion (10.8), and possibly earlier. No… I didn’t experienced this ‘come back’ after quitting and reopening the App Store. Maybe I didn’t get you fully? I have Snow Leopard on an external hard drive and want to keep it. I don’t want to see the upgrade banner offering an upgrade to El Capitan. I followed you instructions but it didn’t work. Is there a problem when boosting from an external hard drive? Too bad you can’t do that to iTunes 12.x.x in Yosemite. You can in EC. I am a Linux professional. My experience with Apple has proven to be less than stellar. OS-X has lots of problems. It hardly lives up to its UNIX heritage. I could have bought two Dell for the price of one macbook air. I expected better for my money. Well, you’re right about *that*, anyway. OS X has turned from being an operating system to put Linux-lovers to shame into a “Platform” for Apple’s services and storefront. It’s a trend that I dislike intensely. Shame you weren’t around during the Leopard / Snow Leopard era. That was a good time to be alive^H^H^H^H^Ha Mac user. I had enough problems when I installed Yosmite. My admin profile was corrupted I couldn’t login. I became so fed up I ended up wiping and installing from scratch. Thank goodness I had my original disc. The bad experience reminded me of my old windows days when I used windows. I know this is a ridiculous reason not to upgrade but I find Yosemite and El Cap to be too ugly to look at. That Dock and its icons are hideous. I’m running Mavericks 10.9.5 on a 12 core MacPro and it’s slower than Yosemite was on the same system for sure. It’s also missing some fairly good workflow features that I got used to in 10.10.4. Safari in 10.10.4 was great. So was iCloud integration and many other things. I found 10.10.4 to be very stable after much testing. However, despite my embarrassing excuse I went back to Mavericks after doing a clean install just because I can’t stand looking at Yosemite. I did swap out the resource icons from Maverick’s Finder and Trash Can and put them in Yosemite but the GUI became a bit too inconsistent. I know they’re trying desperately to match the look of iOS, but the pink 2-D look of Yosemite is offensive to me. I’ll have to upgrade at some point because I rely on some of 10.10’s < features. It will speed up my render farm but I'll have to look at it. Sorry for the rant. I've been waiting since System 7 for the day when Apple would screw up the look of the wonderful Finder. Yosemite was the first real start of that. Oh well. At least it's not Windows or some crappy Linux distro. OS X El Capitan refines the interface a bit and offers some improvements to what the GUI is/was in Yosemite with a new system wide font, gradients in the various buttons and menus, though the icons are largely the same as before. It shouldn’t look as foreign coming from OS X Mavericks, but it does look a bit different. At least Windows (as crappy as it is), and Enterprise Linux distros do not get stuck in repeated “update loops” where the same apps keep re-downloading every day. Even the, so called, genius bar can only offer one solution; clean install OS-X! So far nobody can explain how brand new macbooks get stuck in the loop right out of the box. 1. Re-install OS-X, and keep your fingers crossed. 3. Stop the spotlight indexer, and delete all the index files. This of course completly breaks the app store, and puts an end to all, except for system updates. Then there is the WiFi. If anyone is using a bluetooth device nearby, your macbook WiFi is often inoperable. The problem in most certainly something belonging on a long list of “Apple Original Features” that no other vendor will follow. I am very sorry to say that my Safari got a virus and I couldn’t use it and was instructed to download OS X El Capitan because it should fix the problem. No problems with the download at all. However, (sob) I am a photographer with thousands of photographs in iPhoto and guess what? Apparently gone! iPhoto has a bit white X thru it. Does anyone know if I can retrieve the photos or if I should completely wipe out my hard drive and reinstall everything – possibly just do a restore from my external backup? Please give me an answer I can live with. Open the app called Photos. It’s better than iPhoto. Peggy, you probably are in the same boat as me as another member of my user group (UG). We boat people had not updated to 9.6.1 before allowing Photos.app to be installed with OSX 10.10.3 or later. Now you can’t get the final version 9.6.1 of iPhoto from the App Store or other Web download sites because Apple “no longer supports it”. I was lucky in that the other UG member appealed to our mailing list and one on-the-ball member zipped his version of 9.6.1 and uploaded it to his DropBox for us. So ask around for the final copy of iPhoto or poke around your computer for its Photos replacement and see if you can live with that (probably not, since it has been dumbed down). El Capitan is not compatible with Microsoft Office 365 and One drive for Business. Since Office 365 is the only cloud service which is HIPPA privacy compliant, upgrading to El Capitan is not an option period at this time. Hopefully compatibility problems are resolved by Apple and Microsoft soon. But I may not upgrade my computers till January 2016. Wow that’s interesting to note, and I’m a bit surprised Office 365 doesn’t work with OS X El Capitan yet! Microsoft is often slower to update their software it seems, there are many moving parts so it’s not surprising. Big projects. But indeed, it looks like Microsoft Office is freezing and crashing regularly on OS X El Capitan as reported by many users on Microsoft Support Answers forum, that is a good reason to avoid the update if you need that software. Office 356 ie the only app suite that justies owning a mac. I will likely trade the macbook for a Dell if I can find such a deal in Singapore. If not I guess I am wiping OS-X. Just fwiw, it’s funny that with all the “speed improvements” in 10.11, it’s now almost back up to speed with 10.9 after the hilarity that was 10.10. However, I won’t be moving up from Mavericks as it still gets dramatically better battery life on my machine and sports a far more appealing design to boot. so again, how to get rid of one single update in the app store? I want to get rid of an imovie update. I am not reffering to stuff in the purchase tab. If you delete the no longer supported app from applications folder then the update disappears. My problem is that I did the public beta test of El Capitan. Obviously I am now BEYOND the beta testing. How do I correct my app store update list to remove or at least hide this unwanted update? Spot on reply to my post Omo! I turned off spotlight completely, and removed all the index files. That breaks the non-system update mechanism. Manual updates are required now. The good news is it resuted in a faster and more stable computer! We’ve had nothing but problems with El Cap and Outlook 2011 client. It doesn’t work at all. We’re having to stick with Yosemite until this is fixed. Just DONT install El Capitan yet! Wait for an update or two it’s so damn buggy it’s not worth the effort. Like others on here have said, your instructions do NOT work on Snow Leopard. I keep getting the STUPID update to El Capitan notices. When I open the Updates, the banner is there. If I try to right click or Control + click nothing happens at all, nothing comes up, but the banner is still there. This is absolutely nonsense that Apple is trying to FORCE this crap on us. I have way too many programs that won’t work if I update beyond Snow Leopard. Can you PLEASE tell me how to turn this off? Does anyone as the bug where the Mac AppStore ask to updated to OSX Mavericks but I’m already on EL Capitain ? I hid it, it worked. Now when I want it back I don’t know how to do it. If I follow the link for El Capitan in App Store it tells me that is is not available in the US App Store. How do I get it back?